My huge collection of street maps and Catholic missals. I am a collector, but I’m not a hoarder. There’s a difference. I am proud of my collected items and really should collate them on software such as Google Docs or Filemaker, but it’s so time consuming and I’m essentially lazy. I once used file cards for my LPs and street maps (more later) but I got tired of continually having to update the cards, because once you get a little behind, it’s devilish work getting them updated. Hoarders, meanwhile, collect for the sake of collecting, not the sake of the collection, and do it for purposes that can only be guessed at —and not being a psychologist, I won’t here. You’ve seen the TV show, and read about the Collyer Brothers. Things get out of hand and eventually, the hoarded consumes the hoarder. I’m not like that, but I’m profoundly weird in other realms. As a child I developed a keen interest in both the printed word and fonts, and also a fascination with street maps (much less so with other varieties of maps, though I always considered National Geographic state, country, and world maps exceptionally well-made; I have a complete collection of National Geographic on DVD from 1888 to the present, and look at it primarily for the maps). Before age eight I was perusing the Little Red Books containing the locations and cross streets of every street in NYC, produced by the Geographia Company, which also included a folded black and white map of the book’s borough. Naturally I got the Brooklyn version first, and then the deluxe five-borough version. It was in 1968, though, that the passion was truly kindled because it was then that I acquired the Hagstrom Brooklyn folding map. The resulting explosion over the next few years saw me spending every allowance and odd-job penny on the Hagstrom NYC-area collection, including New Jersey and Long Island. Ditto Geographia, and I soon realized they had a national footprint, with street maps published for every big city in the country. I sent away for them all. I remember pitching a fit one day in late 1971 when the mailman came yet again without the desired package. It did not stop. I soon acquired the now-defunct Gousha and Champion lines of city maps, and even some of the Thomas Brothers west coast city maps, which in the 1970s and '80s were wonderfully hand-drawn. I have never discarded any of these maps, and they’re still in my closet in three plastic milk crates. Now and then I take them out to peruse them, and plan to donate them to a museum when my time is up. Of course, each and every one of these maps has been rendered hopelessly outdated by GPS systems and Google Maps and other online services. 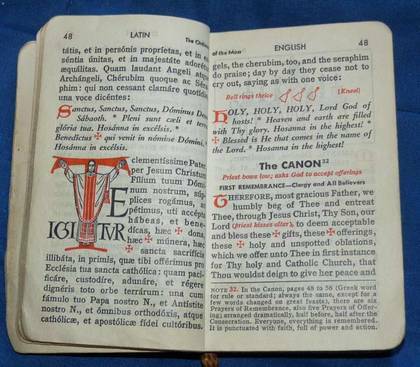 I also have an impressive collection of Catholic prayerbooks, or missals. Now, I have to make a, um, confession. I have a great respect for people of faith. It’s a force for good in the world, and my thinking is that while religion has provoked more than its share of wars over the years—and continues to do so—civilization would have self-immolated long ago were it not for religion. Yet, I have to say, I was not born with the worship gene, neither for people nor for spirits. If Jesus returned tomorrow with legions of angels, my reaction would be, “Thanks for everything! Now what?” It is true I attended a Catholic preparatory seminary, but after all, they did offer a complete four-year scholarship based on my grade-school marks (I found the going much tougher there and in college), but I came away thinking everything I heard would be terrific, if it were only true. In the photo at the top of the article, I have placed just a small part of my collection of missals on the bedspread: daily and Sunday masses, as well as inspirational tomes. Two major publishers competed for Catholic readership, St. Joseph and St. Andrew. At Fort Hamilton Parkway and 53rd Street in Borough Park, Brooklyn, there is a massive nunnery, the Sister Adorers of the Precious Blood, which was established in 1861 in St. Hyacinthe, Quebec and came to the United States and to Brooklyn in 1890 at the request of Bishop John Loughlin (of Bishop Loughlin High School fame). Their present building was constructed from 1905-1910. Beginning in 1925 the order was under the leadership of St. Francis College graduate Father Joseph Stedman, who elevated it to prominence by publishing a massive array of Catholic-themed books under the Church imprimatur labeled Confraternity of the Precious Blood, including missals and philosophical treatises. At the time of his death, it was noted that more than 13,000,000 copies of his books had been sold. Fr. Stedman died at the youthful age of 48. Some of these were St. Joseph editions, published by the Catholic Book Publishing Corporation, which is still in business, producing daily and Sunday missals. Why was I attracted to Catholic missals, of all things? The typesetting. It was, well, glorious. 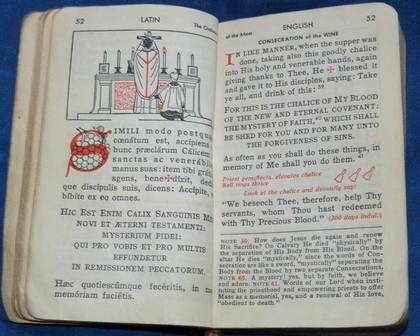 Prior to 1967, Catholic Mass was given in Latin; after that, English was the main language used, though there remained some Latin and Greek (the Kyrie eleison). These missals strive to replicate the illuminated Bibles of the Middle Ages by showing a large initial letter with artwork. Check out the rendering of the first two words of a prayer beginning with the words Te igitur, or the grapes behind the letter S in a passage in which the priest consecrated the wine, which will become the blood of Christ later in the Mass. Missals produced after 1967 eliminated the Latin passages, and in general, the missals themselves got fairly boring, dropping color and illuminated capitals for the most part. I still have them, though, along with the crown jewel of the collection, a Catholic Bible (there are numerous differences between Protestant and Catholic Bibles, with extra or missing books, and different spellings of kings, queens, matriarchs, and patriarchs) which is a marvel, with gilded edges, color photos of the Holy Land, and Christ’s words set in red type. —Kevin Walsh is the webmaster of the award-winning website Forgotten NY, and the author of the books Forgotten New York and also, with the Greater Astoria Historical Society, Forgotten Queens.